Security private accounts, a plan for Medicare vouchers, and a plan for tax credits to replace the current tax deductibility of health insurance. It’s good conservative boilerplate. But it turns out that’s all it is. Those things themselves don’t really save any money. The real action comes from a collection of arbitrary spending limits, but these limits don’t offer any clues about how we’re going to meet them. There’s a freeze on nonsecurity discretionary spending from 2010-2019 — but saying you’re going to freeze spending is easy. The hard part is figuring out what to cut. 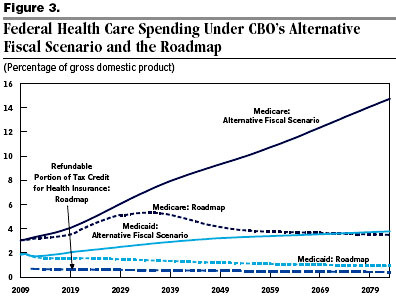 There’s also a limit to the growth of Medicare payments — but saying you’re going to limit growth is easy. The hard part is figuring out how to limit growth and deciding what you’re going to cut to meet your caps. Medicaid is treated the same way: Ryan’s plan simply sets a limit on growth rates without saying how those limits will be met. In fairness, there are a few specifics. The eligibility age for Medicare would rise gradually to about age 70. Social Security payments would be reduced. All the money in the stimulus bill that hasn’t been spent yet would be eliminated. But those are nits. For the vast bulk of the savings, Ryan simply declares that they’ll happen. His bill would cap growth rates, and that’s that. Whatever happens, happens — and he carefully avoids actually saying what would happen. That’s not serious, and it doesn’t deserve praise.